Edited by payneinc at 11:57, 25 Jun 2017. Ok, New error cropped up today. Not sure what caused it but it was during computers turn. Did not crash game, just popped up a few error windows. Edited by RerryR at 15:02, 25 Jun 2017. So first screenshot is my bad, i uploaded a new version with fix. "New or improved Artifacts 1.2" (problem was i forgott to make a check if there actually was a defending hero after fight when setting moral and luck). Hope this helps. The second screenshot i cannot say, i dont have these lines of ERM code on my computer (i think). Maybe upload a save is a good idea if the error persists. From which Mod does it come? Would need to know if i should check for compability. Third screen probably a result of the problem in screen one. Here is a link to the save game. Edited by rerryr at 18:15, 29 Jun 2017. This is a new project i started. You now will be able to increase the power or effect of your combat spells by using them. For example if you kill an enemy unit with Ice Bolt the damage of that spell will increase by 5% permanently. Or if you use Bloodlust it will increase your attack more with every use. Maybe some spells will gain new effects by reaching a certain threshold (maybe 20 uses). Values are not yet decided and suggestions and ideas are welcome. Should there be caps? or how often can you level up a spell in one combat? Your hero has to know the respective magic school at expert and scholar to level up spells. I think scholar fits nicely here. For now it supports only 5 spells. But there will be more within the next weeks. And iam still working on my other projects. There will be little updates next week. Edited by RerryR at 18:45, 29 Jun 2017. Use Mod Manager (its already integrated in ERA installer) to activate different modifications as you like. If you want to try out some of my Mods (or others) just download and activate in mod manager. There are also some excellent maps available as mods. The overall idea of my modifications is that it should be more fun to play a viable "caster" hero by choosing magic oriented secondary skills and not just always armor/offense + earth magic only. For example if you kill an enemy unit with Ice Bolt the damage of that spell will increase by 5% permanently. Values are not yet decided and suggestions and ideas are welcome. Idea is great ofc, but what about cheating by using low and boring level fights to precisely get a deadly spell later? I mean you attack a couple of imps stacks then your spell is +35% in one fight. I think should be related hero level (1-10th level augment spells from attacking lev 2-3 creatures, 11-20 from level 4-5, 20-30 from level 6-7 and so on). Level 1 monsters should not be allowed for increasing spells damage, too easy to cheat. The idea is cool and it would make Ice Bolt unique, a more practical and better solution to Sal's concern of exploiting it, would be not to make it permanent but restrict the damage increase to each battle, so when the battle ends, it would reset. Edited by RerryR at 19:21, 09 Jul 2017. I had some ideas in mind to prevent exploit. 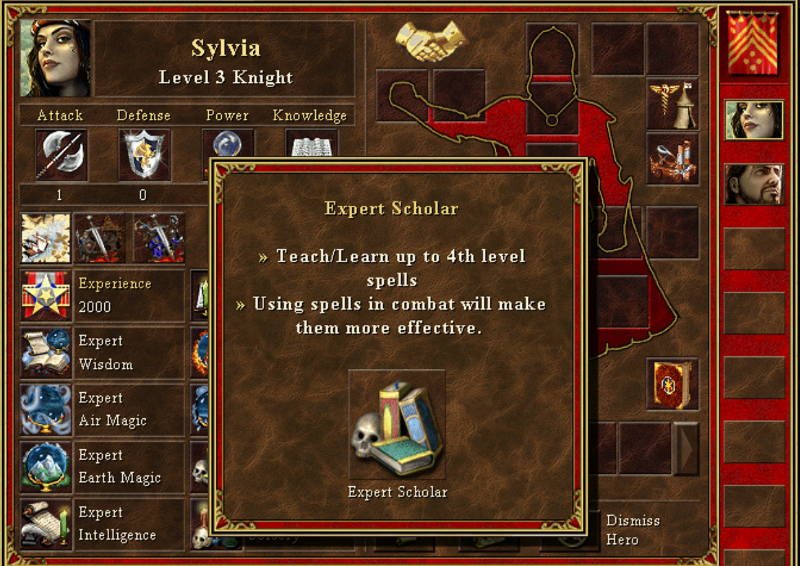 2) Basic Scholar allows you to upgrade 1 spell each day in combat, advanced 2 and expert three times a day. 3) maybe set an hard cap at double or tripple damage. For buffs i think something like dimishing retourns is necessary. and iam a big fan of synergies, so when your heroes knows intelligence, or wisdom, or magic schools you gain a little bit more with every use than without. -also Blind and Cleanse should work correct again. Edited by RerryR at 19:30, 09 Jul 2017. Here is my newest version of the mod. Nearly all mechanics and spells are implemented. Iam still looking for some testers mainly regarding balance, so if anyone wants to provide some feedback that would be great. Overall i think the idea of leveling spells is very nice and i dont know if any other mod in this direction exists, i have only read ideas so far. When a spell gains a level you will hear a sound in combat and you can read level count in the battle log. All supported spells are written in the readme file. Recive +4% damage for every enemy stack killed with that spell. Except Destroy Undead and Death Ripple, these spells get a fixed damage bonus. Spells can be leveled to hero level with 100% success rate. For every level higher then hero level chances are decreasing for level up. Example: Your hero has level 10 and you want to level your implosion to level 11 you only have 90% chance to level up. If your spell is level 11 and you want to reach 12 your chance is only 80%... and so on. So your spell can never be more then 10 levels ahead from your hero level. Also your hero has to be expert in the corresponding magic school. You cannot level basic haste for example. Level ups are sett individual for every spell. There is no restriction for level up buff spells except that you will need a lot of cast if you want to reach very high levels. Protection from Elements and Summoning Elements level up together. So casting Prot. Air also increases your counter for Prot. from Water. I still have some more ideas for future updates, but it will need a little time. Great idea to limit upgrading to hero level. However, if it was my mod, I would add an .ini file where the player can switch on/off this cap level. People who want a decent challenging game would still get it, but on the other side, wog freaks would also be allowed to level their implosion to billions, without any restriction. Just an idea. Thanks for the fun mods, RerryR. When trying to use your custom version of Crimson and Clover, I get many warnings about missing objects. Is there some common prerequisite mod that I am missing? Also, I am curious - what other maps do you like to use with these mods? Edited by RerryR at 19:45, 17 Jul 2017.
yes there are two objects patches and one special mod for scripted battles which you need to play the map. I uploaded a pack with all necessary mods. You can just activate it and play the map. You can activate all mods you want, check my usage.txt in the download folder to see mod order. I usually only play this map, so regarding my modifications i would say the can also work good on random maps. At some point of course you need to keep the balance by increasing difficulty of the map. By the way Spell Trainer Mod is finished. [cape of conjuring] increases the maximal level for your damage spells by 5! Is Master of the Elements no longer a supported mod? I don't see it in Older Versions. Edited by RerryR at 17:39, 23 Jul 2017. Edited by RerryR at 02:16, 29 Sep 2017. After having a little break i started playing H3 again and found a few things which needed correction. Edited by orc at 09:11, 28 Sep 2017.
and lastly, how do I install these things on Era II? I already downloaded extra cast spell, but it was only a .exe file. I did not see any readme.txt or anything. I even opened the file with notepad++ and I couldnt read anything from the code (not sure how people code I use notepad++ though cuz erm scripter I didnt like it and it wasnt neat). *.exe is just self extracting rar file. Click on it and just install/unpack mod. All mods should be within /Mods directory in folder where you have installed ERA. yes, specify your game path when asked (ie C gog Heroes complete) and will self install. Then you need to open mods configuration in mod manager -there should be an icon on your desktop linking to it, then manipulate which mods are enabled/disabled from there. Don't play with all mods enabled!